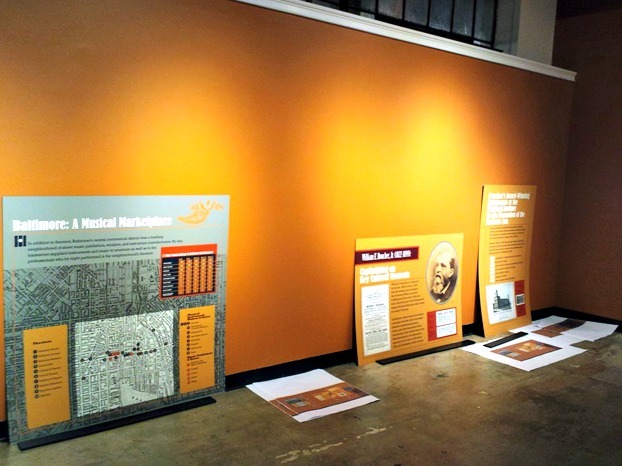 The Baltimore Museum of Industry offers an ever-changing variety of exhibitions about our industrial heritage in our Temporary Exhibition Hall. Whether guest-curated, crowd-sourced, or managed by our own staff, these exhibitions have covered numerous industries of Baltimore’s past as well as their modern legacies. 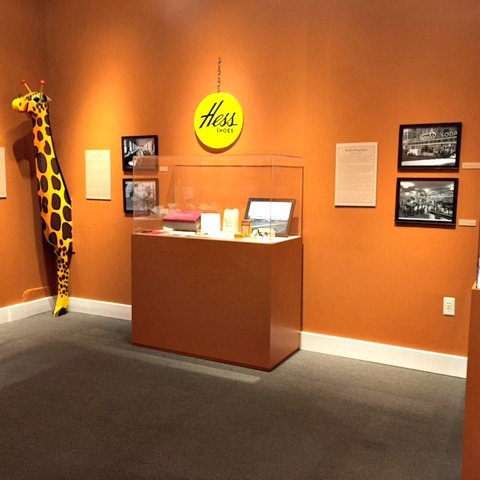 Please visit our Temporary Exhibitions page to learn about our current offerings. REINVENTION: The Work of Chris Bathgate featured 28 works of art made from machined-metal objects by Baltimore-based artist Chris Bathgate. The exhibition explored how modern and traditional machine work can be harnessed to create unique artistic expressions. Bathgate is a self-trained machinist. He utilizes handmade tools and automated CNC (computer numerical control) milling machines and metal lathes to create precisely-crafted elements that assemble into complex sculptures. He has spent more than fifteen years adapting metalworking machinery from salvaged and repurposed equipment. Bathgate’s aesthetic considerations stem from the very machines that he uses to create his sculptures. Each piece that he makes is informed by the one it is preceded by, and he modifies his machinery accordingly—not for improved practical function but for the aesthetic developments that can be produced. REINVENTION also included schematic drawings of his work done both digitally and through Diazo printing, an antiquated process used to create copies of architectural and technical drawings, commonly known as blueprints. Please click here to learn more about Chris and his work. You can explore our interactive 3D animation of Chris Bathgate’s sculptures, designed by Direct Dimensions, right here (on right). The interactive models are also available to use at the museum. REINVENTION: The Work of Chris Bathgate was made possible with generous support from PNC, Direct Dimensions, Comcast, and Creative Print Group. 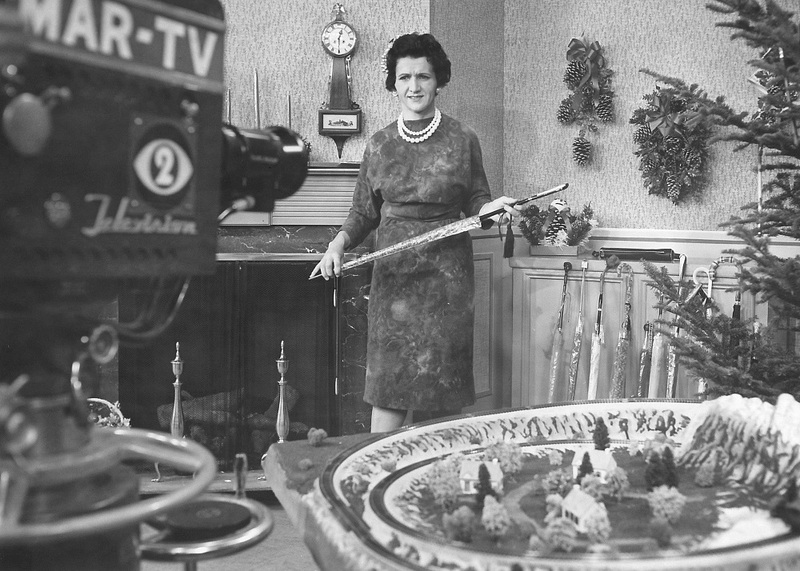 Bentley in Pauline Trigère dress at WMAR-TV Christmas TV program. 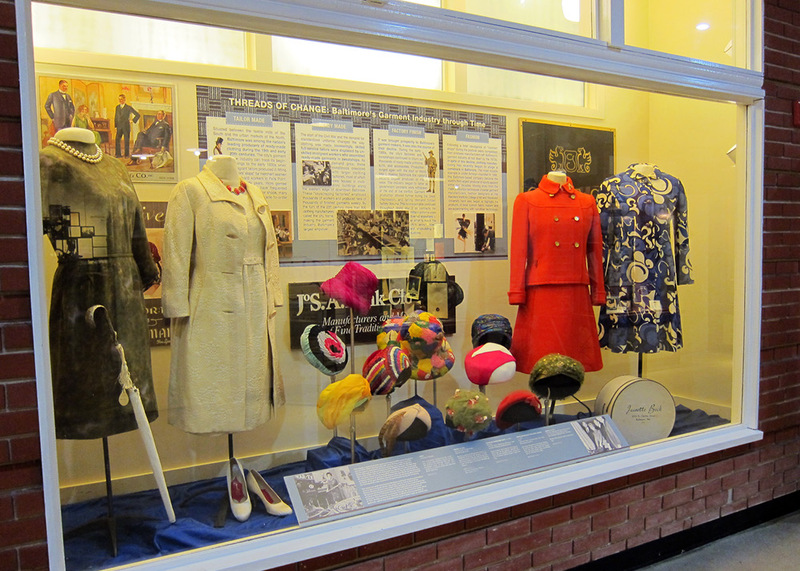 A display of select dresses and hats. Bentley purchased most of her millinery from Jaysan’s of Charles Street & Jeanette Beck, Baltimore. 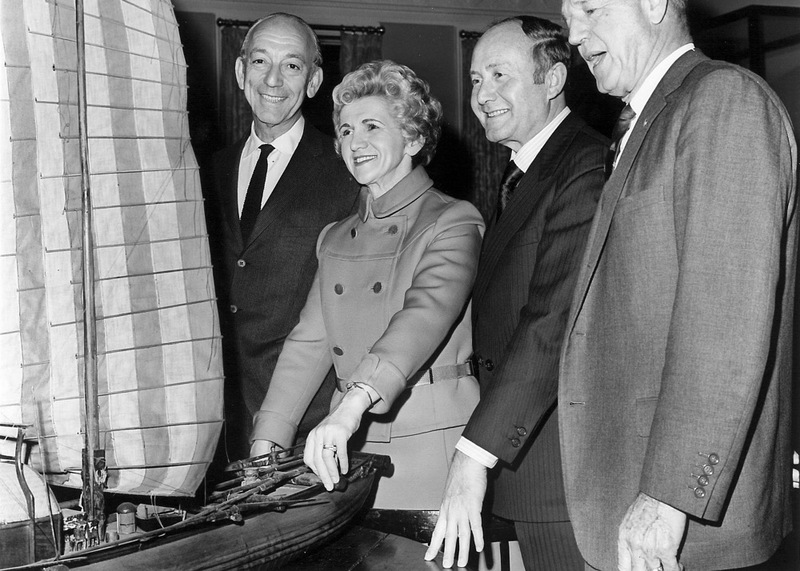 As Federal Maritime Commissioner, Bentley wore this Jeanette Beck dress and double-breasted jacket for an event with Leon Hess (Hess Oil), Joseph Kahn (American Export Lines), and Admiral John M. Will (Sea Train Lines). The Helen Delich Bentley Tribute featured a display of select dresses and hats bequeathed to the BMI by Congresswoman Helen Delich Bentley. Known as much for being stylish as she was for her groundbreaking career as a maritime reporter and elected official, Bentley wore garments that reflected her civic pride in supporting American designers. Four garments and twelve hats were displayed, including an ivory brocade cocktail dress with matching coat (circa 1960), Jeanette Beck label; a moss green and lavender mottled dress (circa 1960), Pauline Trigère label; and a deep brimmed hat covered with multi-colored feathers (1970s), Adolfo Saks Fifth Avenue label. The display also included photos of Bentley wearing the items featured. The tribute was curated by museum volunteer Debbie Farthing. Light Street Wharf THEN BGE.35A, ca. 1916 & NOW Jorge Ruiz, 2015. Mt. Royal at Cathedral THEN BGE.26962, 1925 & NOW Bonnie Schupp, 2015. Then & Now: Baltimore in the Public Eye highlighted scenes of some of Baltimore’s most iconic streets, buildings, and businesses. Then & Now featured historic photographs from the museum’s BGE archival collection paired with ‘now’ photos taken by the general public—professional and amateur photographers alike—that showed what those historic locations look like today. Starting with historic images selected from the BMI’s own Baltimore Gas & Electric Company Photograph Collection, this exhibition used nearly 300 contemporary crowd-sourced photos to reveal a complex city whose past and present have been defined by shifts in the way things are made, how they are moved, and where people live, work, and play. This exhibition not only shed light on the momentous changes that Baltimore went through in the past, but also served as a guide to the changes it is likely to undergo in the future. The Baltimore Gas and Electric archival collection consists of approximately 80,000 photographs and negatives. These images were taken as part of BGE’s daily operations, and capture Baltimore’s workplaces, cityscapes, and life in Baltimore from the late 1920s through 2001. The exhibition, early on. Many, many more notes were added over time. Some offered brief comments, others wrote longer observations. Even our youngest visitors were moved to participate. 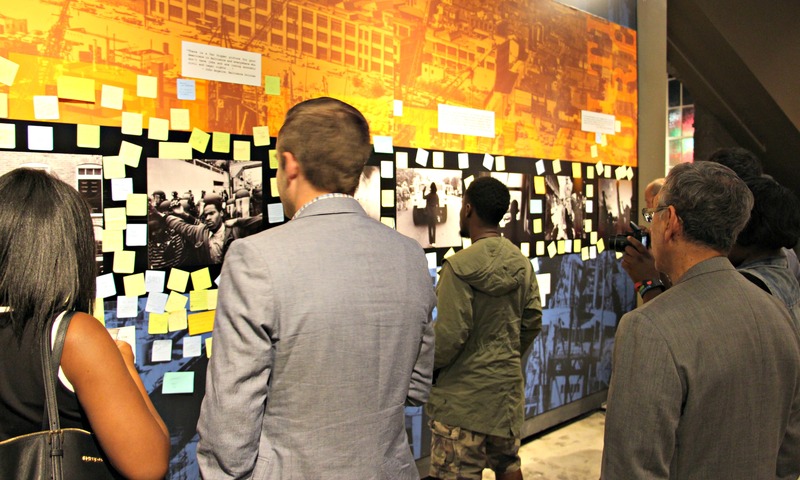 A reception for the exhibition drew visitors from across Baltimore. 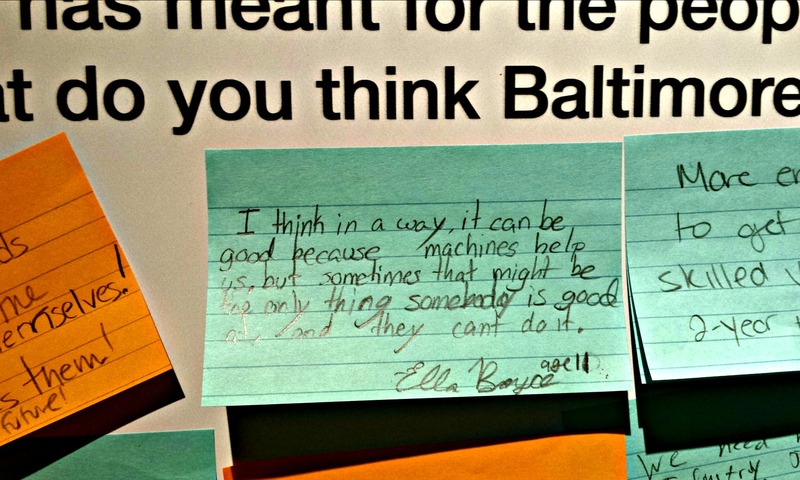 The Changing Baltimore: Share Your Voice exhibition explored the link between Baltimore’s loss of manufacturing jobs and the spring 2015 protests around the city. Featuring eight stirring photos from local photojournalist J.M. 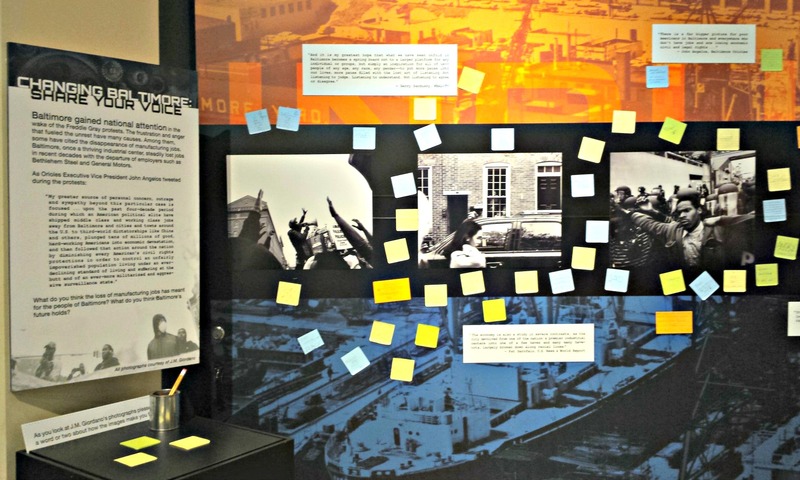 Giordano, and quotes from a variety of voices—including Dan Rodricks of The Baltimore Sun, Gerry Sandusky of WBAL-TV, Louis Hyman of Cornell University, and others—the exhibition invited visitors to think about how the loss of manufacturing jobs impacted the people of Baltimore, and what the city’s future holds without such jobs. 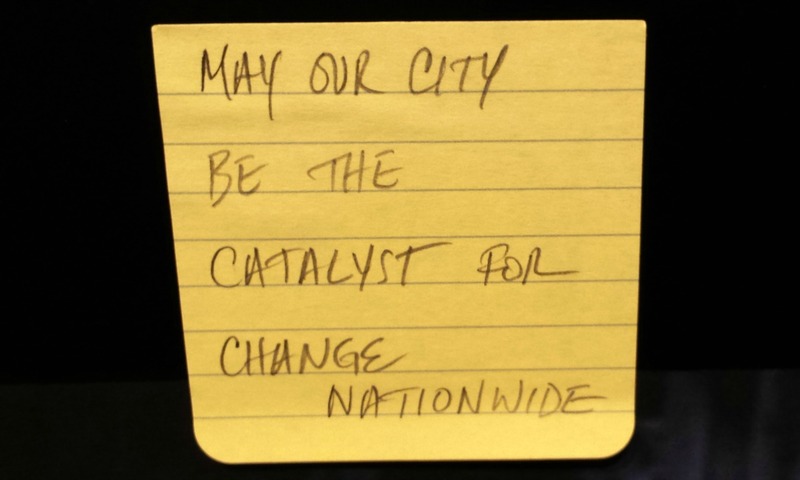 Visitors were invited to leave comments on notes adhered to the exhibition itself. J.M. Giordano, an award-winning photographer, graciously donated the use of his photos for Changing Baltimore: Share Your Voice. 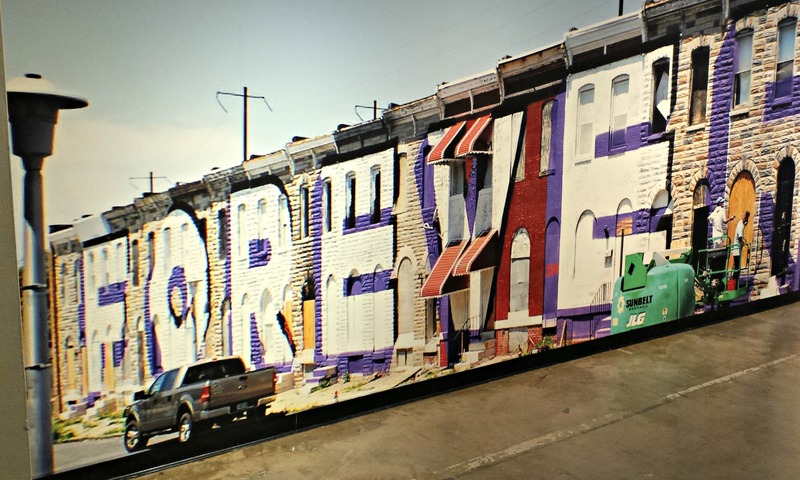 A 2014 public art project demonstrates a modern use of historic techniques. A 1950s “walldog” paints a sign for a car dealership in Baltimore. Painting a 1940s window. This indoor job offered a challenge: lettering backwards. A sign painters’ kit, supplies, and block & tackle for scaffold work. Not Yet Lost! The Art of Maryland Sign Painters featured the rich history of Maryland’s sign painters and was guest-curated by Samantha Redles as her thesis for her Master of Fine Art degree at the Maryland Institute College of Art (MICA). Not Yet Lost! 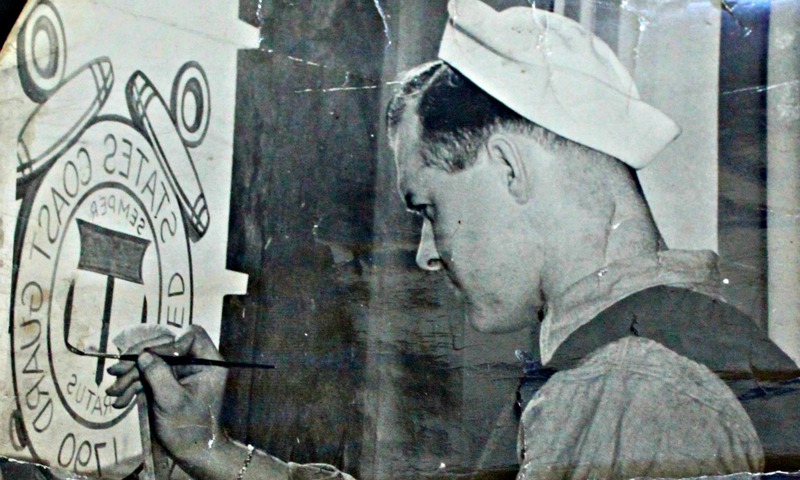 highlighted local sign painters who transformed Maryland’s visual landscape and examined the art of hand-lettered signs through the work of individual artists. 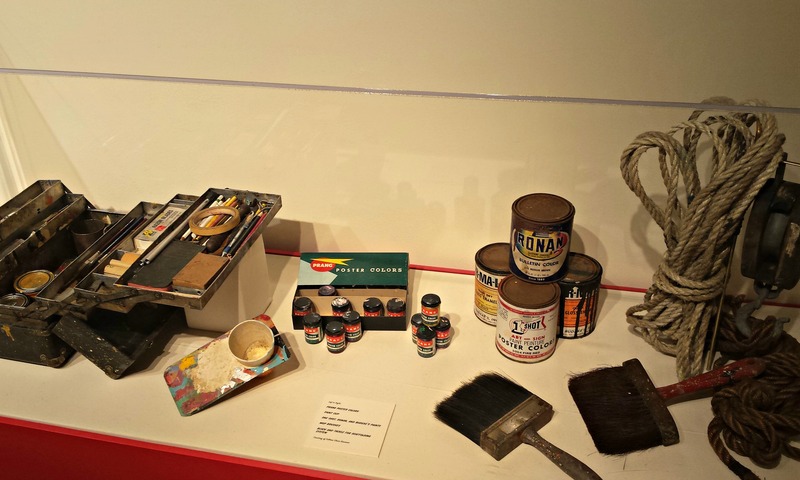 The exhibition was an opportunity to experience rare photographs, artifacts, memorabilia, and original artwork and examine the processes behind different types of hand-lettering. 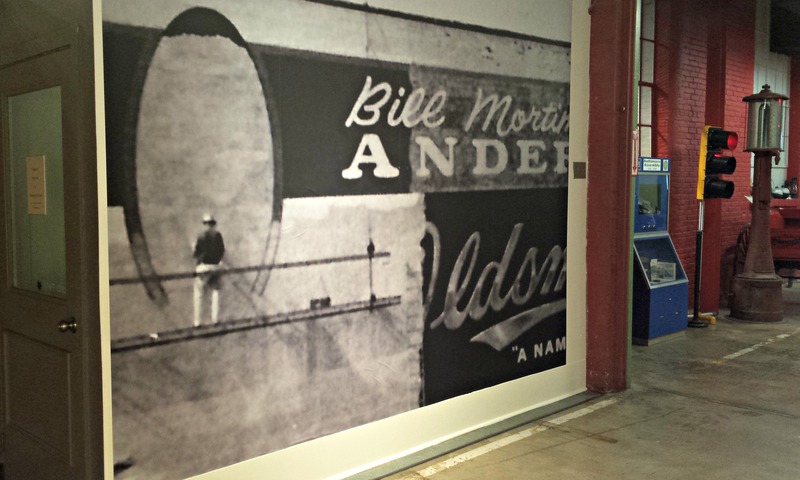 Redles’ thesis reflected on a time before computers when sign painting dominated advertising. Trained craftsmen carefully painted all of the traffic signs, storefront signs, billboards, large advertisements, and more. Not Yet Lost! The Art of Maryland Sign Painters is made possible through the generous support of: Sponsors—GableSigns & Graphics, Maryland Institute College of Art, MICA Graduate Studies, MICA Office of Community Engagement, Maryland State Arts Council, SMI Sign Systems. Lenders—Brendon Brandon, Gary Eddington, Linda Gillis, Ruth Jones, Bob Merrell, Colleen Olson-Bauman, Ole Olson. Contributors—Patrick & Veronique Caubel, Alice & Skip Guentensperger, Maryland Sign Association, Eleanor Miller, Steve & Lynn Miller, Jim & Peggy Nallo, Rick Parker, Lynn Redles-Goldberg, Ken & Linda Redles, George & Rebecca Zuck, Peter Zuck, Ray & Janice Zuck. One of the well-known giraffe figures from the Towson Hess Shoes store. 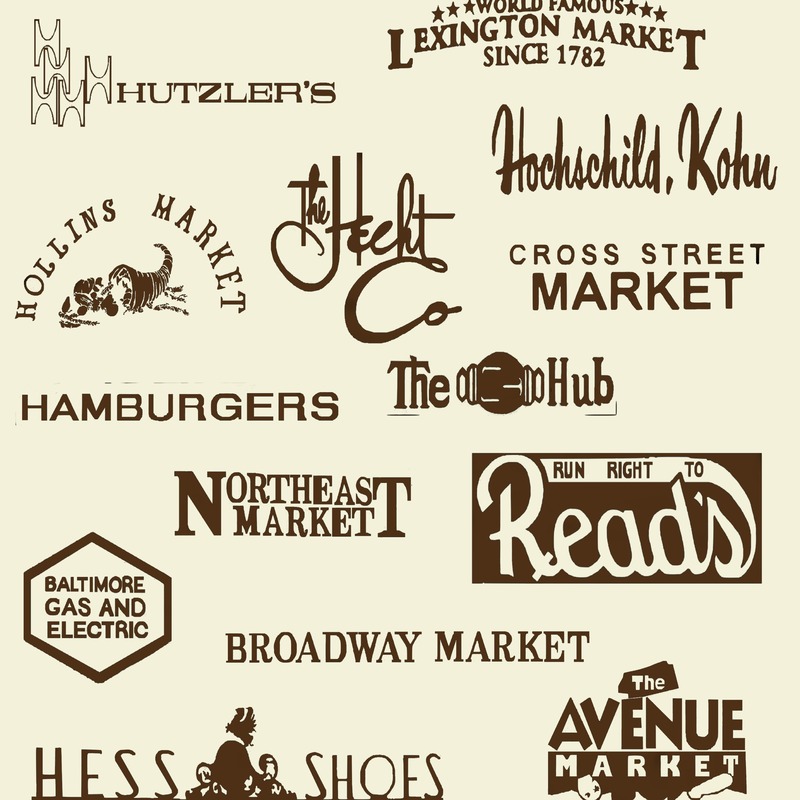 Logos from classic Baltimore stores and businesses. Packaging for local food and drink producers. 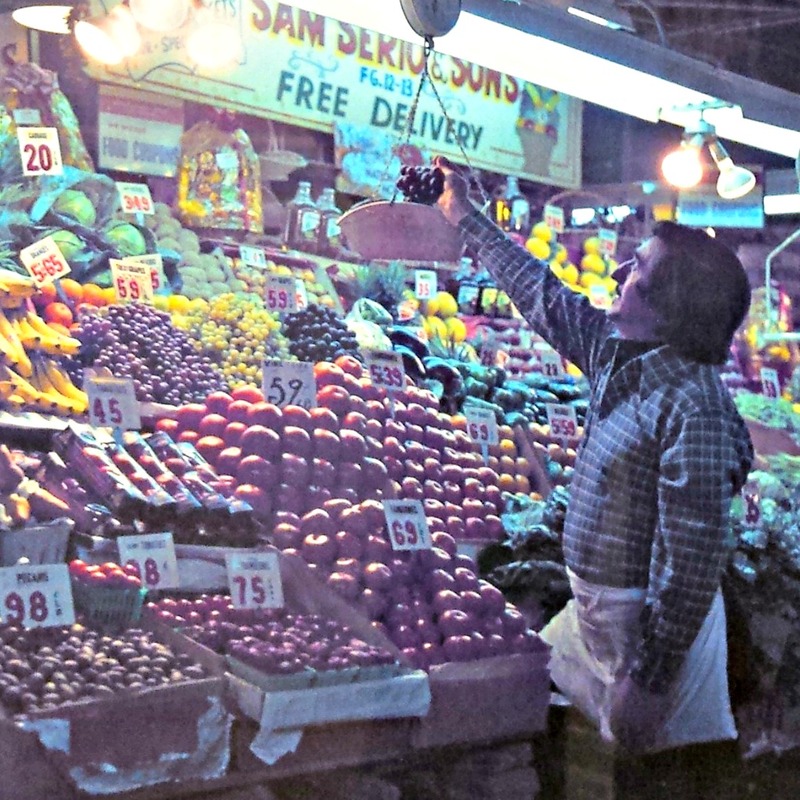 A shop in “World Famous Lexington Market,” 1975. The Baltimore Shops exhibition offered a look at many of the places and businesses that made shopping in Baltimore unique and highlighted the history of local public markets, department stores, and independent merchants and the impact they had on Baltimore life. Baltimore Shops used photographs and objects from the BMI Collections to show how bustling 19th century markets, once-mighty department stores in the downtown shopping district, and local independent merchants have left a distinctive imprint on Baltimore. More than just places to shop, they became a way of life and an integral part of the character and identity of Baltimore. Baltimore Shops was made possible by the hard work of a number of Collections Department volunteers, including: Debbie Farthing, Guest Curator; Gary Boats, Fabrication; and Caitlin Farthing, Graphics; as well as Molly Henderson; Megan Hipsley; Jessica Seaman; Cole Simon; and Anastasia Suryaputri. The entrance to the Hall, introducing the banjo exhibition. A peek behind the scenes of the installation process. One of the programs with this exhibition was an old-time jam session. 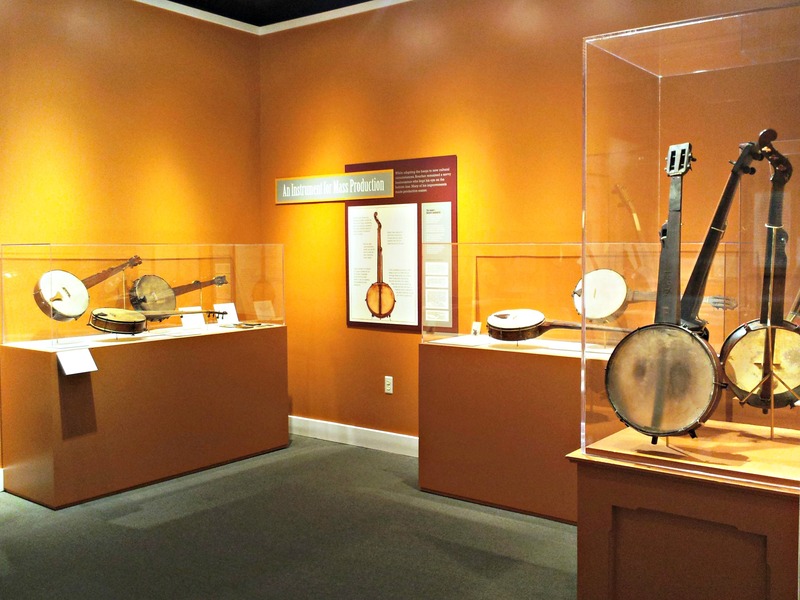 The exhibition featured a number of historic and reproduction banjos. 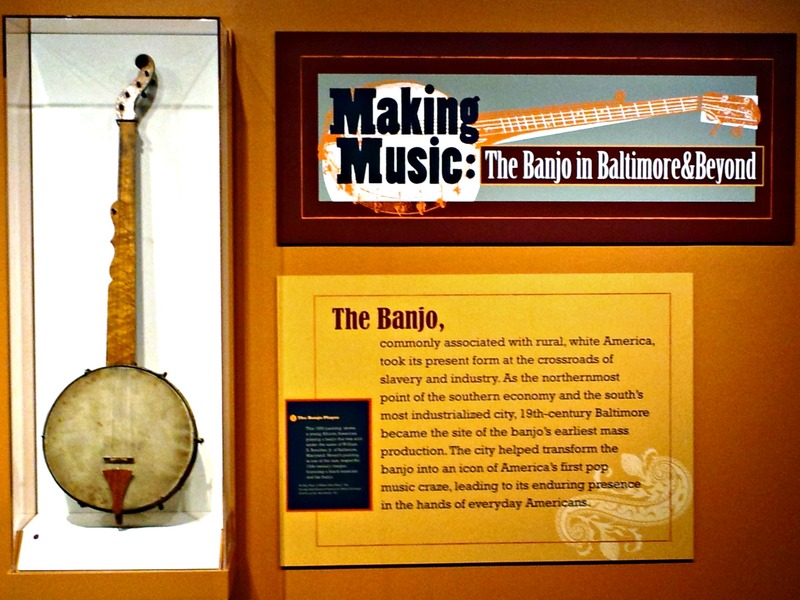 Making Music: The Banjo in Baltimore & Beyond featured banjos, sheet music, and profiles of local banjo makers, and explored how our city was instrumental in the history of American banjo music. Throughout Making Music, we presented some of the ways in which banjo history is linked to a complex American past whose legacy is all around us. For nearly 300 years, the banjo has been a part of the American narrative, with the city of Baltimore playing an integral role in its legacy, from the manufacture of instruments to being the birthplace of some of the most highly regarded banjo players in history. Baltimore residents helped to transform the banjo into an icon of one of America’s first popular music crazes, leading to its enduring presence in the hands of everyday Americans. Today, the banjo’s deeper cultural significance is increasingly found online, maintained within music communities, described in new scholarship, and expressed within local outreach efforts. 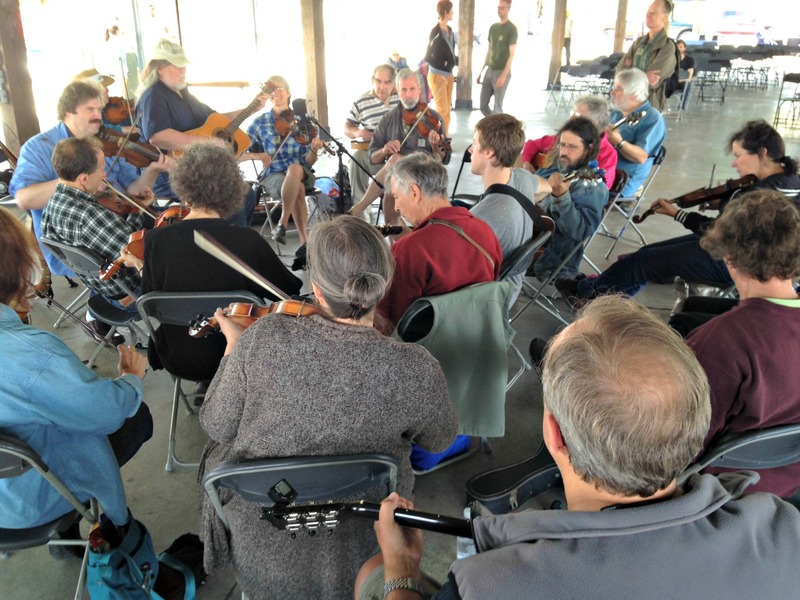 Baltimore continues to be a hub of banjo talent and scholarship. Making Music: The Banjo in Baltimore & Beyond was made possible by the efforts of guest curators and banjo scholars Robert B. Winans, Peter R. Ross, and Greg C. Adams, and with support from the Maryland Humanities Council and Maryland Arts Council. Click for a Google map. FREE on-site parking for our guests. BMI Members – Always Free! Museums for All Visitors – Always Free! BMI proudly offers free admission to active duty and retired military personnel, with military ID. Group rates available by reservation. Contact tours@thebmi.org or 410.727.4808 x117. There are many ways you can show your support for the Baltimore Museum of Industry. In addition to cash donations, which can be pledged by check or credit card, the BMI gladly accepts gifts of stock, planned or deferred contributions, and in-kind services. To discuss giving options, please contact the Development Office at giving@thebmi.org or 410.727.4808 x129. 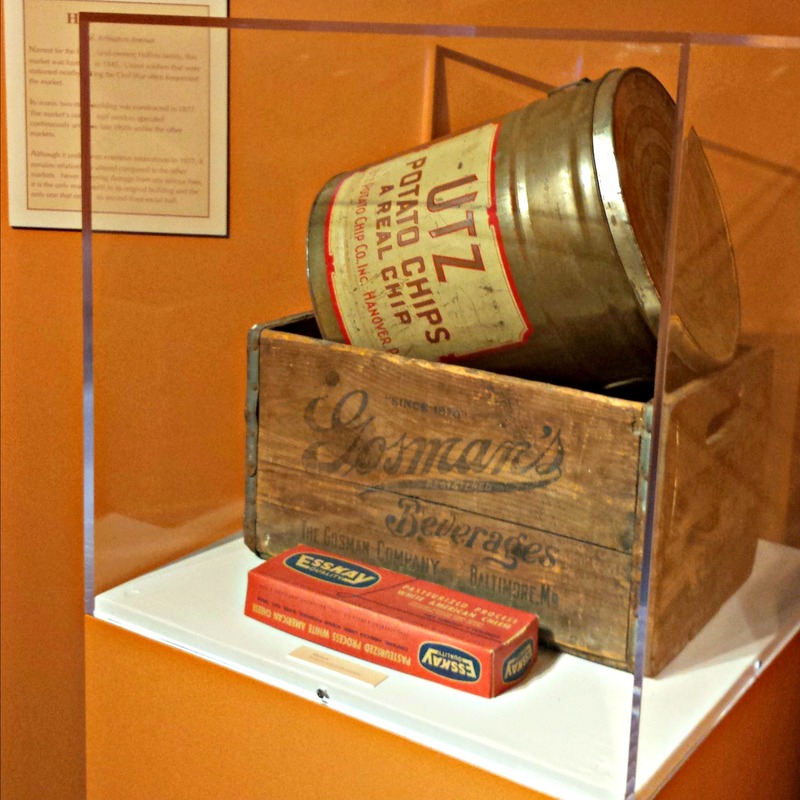 To learn more about donating artifacts to the collection, please visit our Artifact Donation page. Sign Up for BMI Email Updates! Thank you - you have successfully subscribed!